And... cut! Thanks, you two. That was great. So why would such a small shark be cause for such panic? Let alone a kitchen utensil shark. Let alone a something-to-do-with-cookies shark. I guess you just have to look at the thing. It doesn't look like something I'd want in my kitchen. It doesn't look like something I'd invite over for cookies, either. But that isn't saying much, cookies have to be torn from my cold, hungry hand at the best of times. 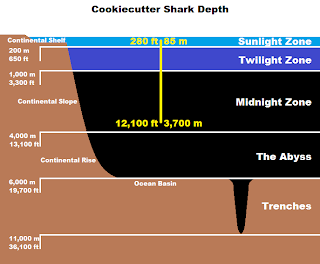 But the real problem is the cold, hungry Cookiecutter Shark. Big, meat-eating sharks might go for seals and fish, kill, eat and leave nothing but crumbs behind. Cookiecutters on the other hand, are nibblers. They can attack seals, fish, sharks, dolphins and even whales, taking just a mouthful of flesh before they scarper. It seems your options are far greater when you feed by wounding rather than killing. Wouldn't hurt a fly. Hurt a whale, though. It's for this reason they were once known as Demon Whale-biters. It didn't stick, though. I guess it didn't stand a chance without mention of cookies. But how on earth can this thing bite a whale? It's like those little yapping dogs... "don't worry", they say, "his bark is worse than his bite." Cookiecutters don't bark. They put all their energy into a really nasty bite. So let's take a look at their apparatus. Teeth. Those on the upper jaw are small, sharp and simple. The ones on the lower are... different. It looks like a guillotine, with all the teeth stuck together into a single plate of cutting. Like other sharks they have a constant replacement for missing teeth. The problem with the lower set is they lose the entire plate each time rather than single, individual teeth. Their answer is to eat them as they drop, trading in a visit from the Tooth Fairy for a calcium top-up to help grow new chomps. Shark skeletons are made of cartilage rather than bone, so this calcium has another use for the Cookiecutter. Extra calcium in the head and lips give their bite extra strength and much needed nastiness. When a gigantic chunk of meat wanders by, the Cookiecutter moves to action. They clamp themselves onto their host. Their extra-strong lips are suctorial in shape, providing a watertight grip. 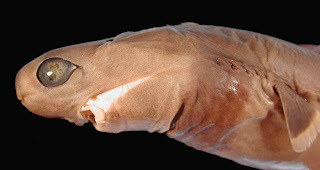 Cookiecutters, like some other sharks, have holes behind their eyes called spiracles. These are used to pump water into the mouth so they can breathe without swimming. Closing them means water can't get into the Cookiecutter's mouth. The tongue is now retracted, increasing the volume within the mouth. But there is no way for water to flow in, so the effect is suction. With the lower teeth dug into flesh and the upper providing grip, the Cookiecutter twists and rotates. A circular chunk of meat about 5 cm (2.0 in) across and 7 cm (2.8 in) deep is gouged out. The Cookiecutter points, laughs and leaves. Gruesome! At least attacks on humans are rare. Not unheard of, just rare. You may well ask why a massive whale or a speedy dolphin would allow such a thing to happen. 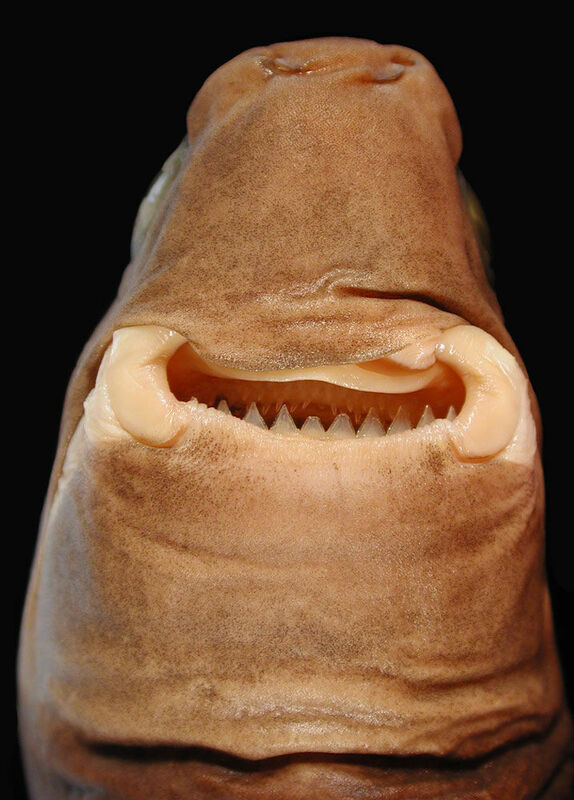 A clue is that Cookiecutter Sharks are from the deep sea, living at depths of up to (down to) 3,700 metres (12,100 feet). But this is only during the day. At night, this terror rises from the eternal darkness to hunt at just 85 m (280 ft) depth. Apart from these migrations, Cookiecutters don't move much. They are ambush predators, hovering silently in the water column. Like many other deep sea fish they use counterillumination, where their underside lights up to match the surrounding twilight and mask their silhouette. This is used to hide from predators and prey alike. Cookiecutters also have a dark patch near their gills which doesn't light up. 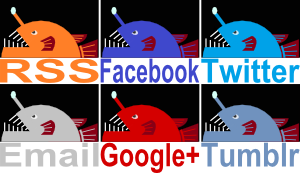 This might make them look like a small fish, perhaps attracting prey. If that's the case, they'd be the only bioluminescent fish to use darkness as a lure. You'll be pleased to know that these ambitious little tykes are found in warm waters all over the world, and the females have 2 uteruses and give birth to 6 to 12 live young. They will soon grow into remarkable creatures, linking the familiar ocean surface to the alien depths and leaving us a clue to the awaiting horrors of the Abyss. Another fantastic post. I'm sure these guys would far prefer to be called DEMON WHALE BITERS though. Much tougher. @TexWisGirl: Yes! Anything more than that would probably be a string of swear words! @shewalkssoftly: Thank you! I'm sure they'd much prefer the tough name. A tattoo with "demon" would be much meaner than "cookie"! Gah, why!? Couldn't they at least have some sort of numbing agent? But wait, why do they need to chomp and flee anyway? It's not like whales can just swat them away. You'd think they could just latch right on like a lamprey and make enough cookies for everyone. I don't think sharks do numbing agents. I guess when you never need a dentist because all your teeth are naturally replaced, you lose a certain empathy! I guess a whale couldn't swat exactly, but a giant like that struggling in pain might be difficult to keep hold of. Let alone dolphins, seals and the like. And I don't think they can breathe while attached (mouth and spiracles both closed). I'll have to get to Lamprey to see how they do that! I wonder if their cookies for everyone would be burgers or tins of tuna? These look so ridiculously funny that I almost laughed at them! Well, almost - because before I stared at their faces for too long, I read about their behaviour and I would not want to anger them! I think they literally are the dividing line between a predator and a parasite... nasty, nasty things. The bite is two inches round and almost three inches deep? More like a plug sucker! That's almost the size of a sirloin steak! It's crazy! At least they get a good mouthful! Just make sure they haven't bitten anything else before hand! I have seen one attack a fish before.